At DutchCrafters we offer quality, authentic hickory furniture that is handcrafted by American Amish woodworkers. This Amish Hickory Glider Rocker is perfect of the living room, office or outdoor porch by adding our outdoor finish. This Amish handcrafted hickory wood Glider will make an excellent and outstanding addition to your log cabin or vacation home. The back and seat are shown in oak wood but are also available in maple, cherry, walnut or hickory with natural or stained finish. Take a moment for yourself or enjoy the fine company of friends and family while sitting in an authentic Amish Hickory Glider. We also offer the Amish Gliding Ottoman and Amish Rustic Small Footstool for a comfortable place to rest your feet. Because this Amish Hickory Glider is made out of solid wood by Amish wood workers who are supremely dedicated to their craft, no two Amish Hickory Gliders are exactly the same, this Amish Hickory Glider will no doubt become an heirloom piece in your family that gets passed on from generation to generation. The Blue Mountain Hickory Glider usually ships in 5 to 10 weeks. If you have any questions or would like to order over the phone, it only take a few minutes to make a call at 1-866-272-6773 to our furniture specialists for consultation. They are happy to help in anyway that they can. 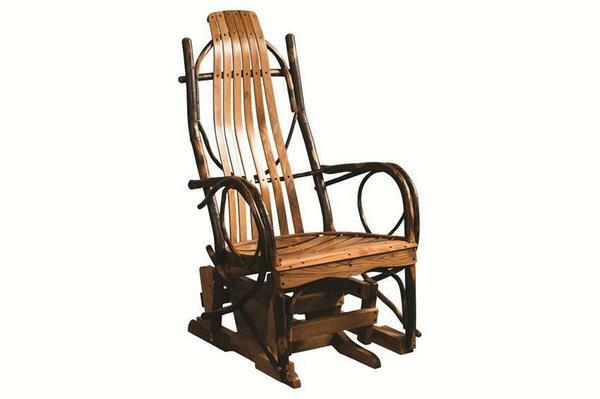 You will be impressed with the authentic hickory rustic glider rocker. Shown in Medium Walnut Stain.